Poster created by artist Allen Saalburg (June 25, 1899 - July 25, 1987) for the Office of War Information in January 1942. One of the first propaganda posters to be issued after the start of the war, it was commonly seen in factories and military bases around the United States. 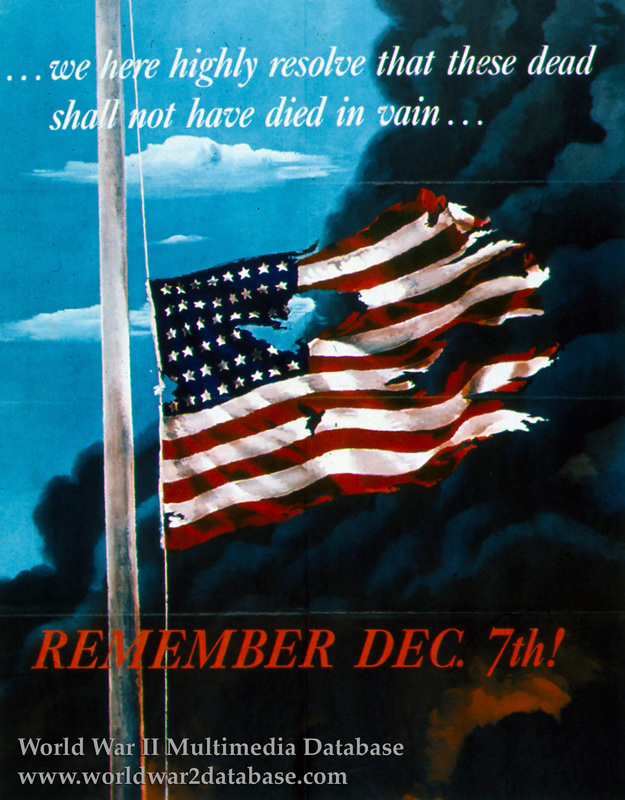 As the war progressed, instead of "Remember December 7th!" the slogan "Remember Pearl Harbor!" became more common in American propaganda. The quote is from President Abraham Lincoln's Gettysburg Address. Allen Saalburg was born in Rochelle, Illinois. His father was a newspaper cartoonist and printer. Saalburg studied painting at Pratt Institute, and with William Sloan at the Art Students League. Saalburg, like many other artists, headed a project of the Works Progress Administration (WPA) during the 1930s in New York City, designing murals for Central Park's Zoo, Arsenal, and other buildings. During the 1930's, he also designed magazine covers, theater and movie sets, and murals for the 1939-40 New York World's Fair. After moving to Pennsylvania in the 1940's, he painted commercial murals and did silk-screens on paper and glass. When the war began, many of the WPA artists were tapped to create propaganda through painting and photography. Under the Rule of Stalin's Generals, Forward to Liberate Our Motherland!